Anna received her Doctorate of Physical Therapy from the University of Washington and began working for MTI Physical Therapy in 2011. She has experience working in hospital, rehabilitation, and outpatient settings, helping patients of all ages to recover from surgery, illness, athletic and overuse injuries. 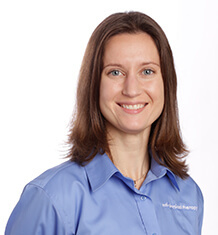 Anna now focuses on the treatment of musculoskeletal injuries, and has completed both residency and fellowship coursework in manual therapy through the Ola Grimsby Institute, and is pleased work as a clinical mentor for residency and fellowship students. Anna also enjoys traveling and spent a year living abroad in 2005. In her spare time, she snowboards (badly), jogs, and bikes, and also enjoys gardening, photography, cooking and a good book.